Available via our Payment Page price including registered insured postage £107.00. 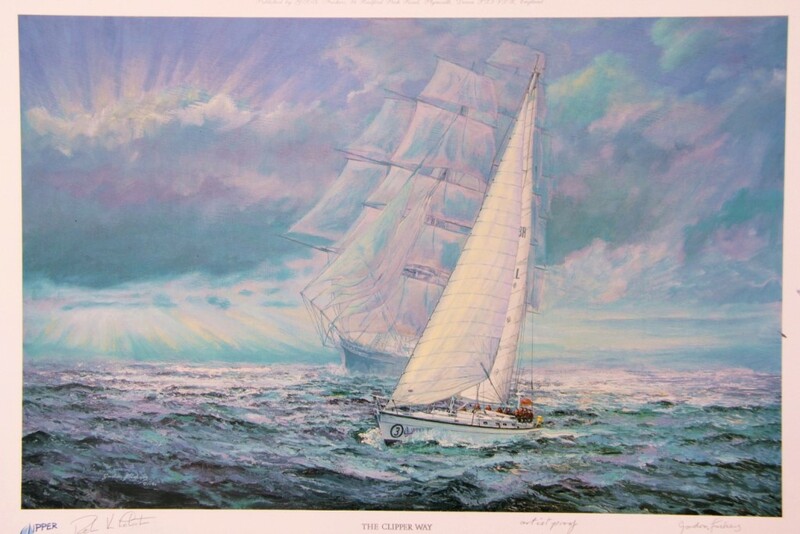 This marine print is co signed by Robin Knox-Johnston, each print is numbered and measures 33 x 50 cm (13″ x 20″). His own career started with the British India Steam Navigation Company as an apprentice on “Dumra” working on the Bombay Persian Gulf routes. Today Sir Robin Knox-Johnston is a Master Mariner who has greatly enriched our culture and the lives of countless folk. Robin built his own boat at Bombay while an apprentice cadet with the British India Steam Navigation Company, formally the largest shipping company in the world and much loved by all who served B I, (subsequently merged with P&O). In Suhaili in 1969 Robin was the first person to circumnavigate the globe, nonstop, single handed. Robin’s life of high adventure continues. 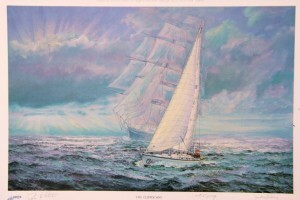 Today, over 70, he still ocean races, he also shares voyaging with the crews of the Clipper 60 yachts as they race the Clipper ship trade classic routes 33,000 miles to many of the most exotic trading ports in the world. If you fancy passing from the Caribbean through the Panama Canal to the Galapagos Islands for Christmas, on to party on Hawaii, China, Japan, Hong Kong, Singapore, Durban, Rio & more this could be the race for you! The sailing is competitive, the socializing & friendships, unforgettable. Some crews go the whole distance; others join for particular legs. Currently the event is sponsored by ‘The Times’ of London. The painting, developed from an idea of Robin’s, to show a Clipper 60 yacht. The roundel under the bow is left blank. That way whichever boat the crew is associated with, the print can be personalized by the addition of the relevant number. The ghostly tall ship in the background, the spirit of a Clipper, is the famous “Thermopylae“. Like her great rivals including “Cutty Sark“, she was built in Scotland of a quality later yachts would aspire to. She originally raced for cargoes of tea & later, wool. Some considered her faster than the “Cutty Sark“. 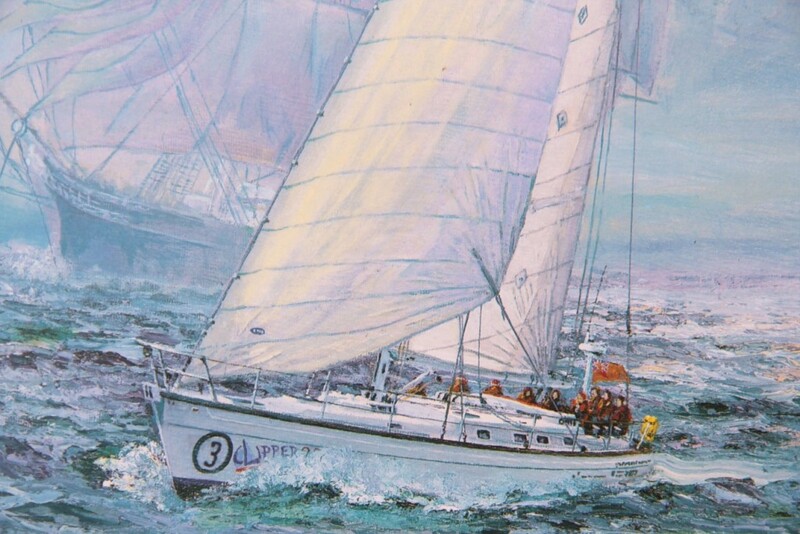 Her green hull, figurehead & distinctive rig easily identify her in our painting. 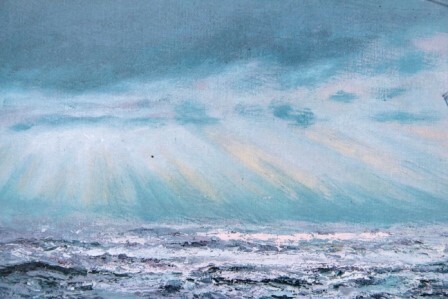 Would you like to become one of the distinguished few who own an original Frickers painting? It may be easier than you fear, talking is free and fun, contact us. You can purchase securely via our ‘Payments Page using Paypal or bank to bank. We give you an unrivalled guarantee.